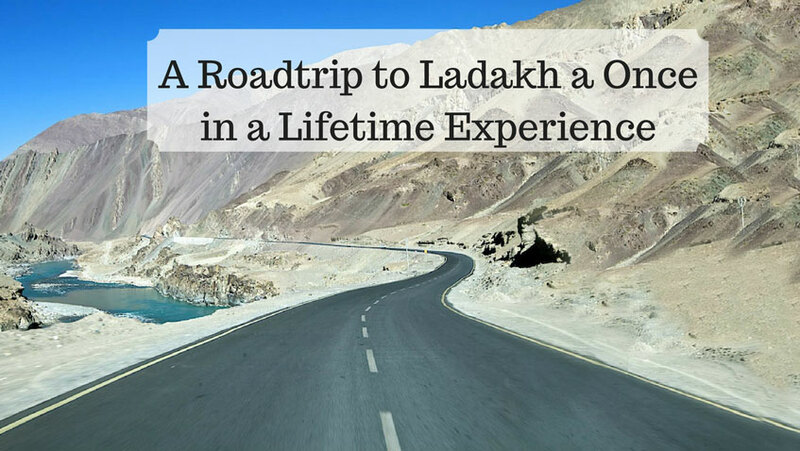 A Roadtrip to Ladakh a Once in a Lifetime Experience - Love With Travel - A Travel and Lifestyle Blog. There are two routes to Ladakh and it takes two days for each of these journeys. Sindhu Darshan Festival is between 12-14th June 2016 at Sindhu Ghat near the town of Leh. Do visit it if you are planning your trip in June. If you plan to take the Manali-Leh Highway, start early for Rohtang Pass to avoid getting stuck in traffic. Rani Nallah before Rohtang is a slushy area and needs to be trodden carefully. You can drive your own vehicle to Leh. If you are taking a car, an SUV or MUV would be the best option instead of a hatchback or sedan. Himachal Pradesh Tourism and J&K Tourism operate daily deluxe and ordinary buses between Manali and Leh for a two day journey with stopover usually at Keylong. Groups can take, ordinary, Deluxe and A-class buses for Leh, Kargil or Padum (Zanskar) from the J&K SRTC at Srinagar. Taxis (cars and jeeps) are available at Srinagar /Manali for the journey to Ladakh. Rohtang Pass (3978 m) – Crosses Pir Panjal range. Opens in early June. Leave early to avoid traffic. Closed on Tuesdays for maintenance. Bara lacha La (4890 m) – Crosses Great Himalayan range. Opens in April. Tanglang La (5328 m) – Crosses Zanskar range. Zoji La (3528 m) – Connects Ladakh with Kashmir. Opens by late May or early June. Fotu La (4108 m) – Highest point on the Srinagar-Leh route. June-August is the peak season that attracts a large number of tourists and travellers to visit Ladakh. Roads are open in September and October also, but it gets very cold to stay en route or find places to stay. Carry waterproof backpacks and handbags for day hikes. Avoid strolleys and heavy suitcases. Analgesics, Aspirin, Advil or Tylenol – for headaches etc. (NOT Codeine based pain killers) prescribed by your doctor along with your regular medications. Re-hydration salts (oral)- 6-8 sachets/Gatorade type electrolyte. Start taking Diamox 24 hours before Manali but after consulting a physician as it gives tingling sensations on fingers and irritation on face. Carry proper woollen clothes (esp. for the months of April-July & October-November)- Jackets, Sweaters, Comforters, Shawls etc. You will need layers of clothes in the cold and airy weather of Ladakh. However in the months of August & early September you will NOT need much woollens. Sometimes there are unexpected showers of rain/snow. Therefore you will need Rain Jackets or raincoats and umbrellas. A good quality camera will ensure you capture the scenic and magnificent views throughout your journey. Memory cards of a considerable size are advised. Carry fully charged batteries and chargers along, as the batteries tend to lose their charge quickly at higher altitudes. Some electrical devices (Cameras, I-pods, etc.) may behave differently (work improperly/stop working) at higher altitudes. Get your vehicle properly serviced before the trip. Carry a spare tire and a mechanical tool-kit – you may need it during the journey on the rocky and uneven terrain. It is advisable to carry a large container for fuel as there are only a few fuel pumps on the way. Even if your fuel tank is full, pick fuel from Tandi as the next petrol pump is available only at Upshi, 365 km away from Tandi. Start early in the morning for all journeys as you will reach your destination on time and not miss the view enroute. Out of State Vehicles (only 4 wheelers) need a permit to travel from Manali to Rohtang Pass which is issued by the Office of Sub-Divisional Magistrate, Manali. Rani Nallah between Marhi and Rohtang Pass. Though it is being imporved. A couple of streams and slushy patches to watch out for near Rohtang. A couple of patches to look out for before Drass. A few bad patches for the first 15 -20kms from Kargil towards Leh. Kargil- Zanskar the only region with very bad roads/absence of roads. You will find good roads till Sankoo after which you would encounter many streams. Remember to leave early and cross the streams before 11 am – 12 noon after which the water level starts rising. Leh-Khardung La – Nubra (Panamik and Turtuk as well) around 25 km of bad stretch towards the Khardung La top. Since there are NO toilets on the way (only available in camps etc. ), it is normal to make a group and go behind rocks. DO NOT avoid drinking water due to this reason. It’s important for acclimatization! According to a government guideline of 2014, Indian tourists no more require permits to visit inner line areas like Pangong Tso, Nubra Valley and Dha Hanu etc. Only photo identity proofs issued by the government of India like Passport, Driving License, Voter Id, PAN card etc are needed. Foreign tourists however still need to obtain permits for these areas. Permits can be obtained through registered travel agencies in Leh or from the DC office in Leh. You could ask your tour operator / hotel manager to arrange this for you. Remember to carry 6 photocopies of the permit while travelling, to submit at the Checking points along with your ID proof. You can take out a day to spend in Leh and get your permit. Remember to download the application form for the permit online and fill it in advance. You can stay in hotels and guesthouses in Manali and Srinagar. Leh too offers a wide array of hotels ranging from expensive ones like Grand Dragon to budget guest houses. Pangong, Tso Moriri, Sarchu, Jispa, Tso Kar, Hunder have mainly camps. Pangong has Whispering Waves, the camp where Shahrukh, Anushka Sharma and Yash Chopra stayed during the filming of Jab Tak Hai Jaan. You can find medical aid at army camps at Pang and Sarchu. Only BSNL, Aircel and Airtel have their networks in Leh. Tourists with post-paid mobile connections from these operators can use mobile phones in this region. Nubra valley: Phone booth in Diskit, BSNL works in Diskit, Hunder & Sumur. PangongTso: No mobile connectivity near Pangong Tso lake. However, Tangste (15 kms towards Pangong) has a Satellite phone booth and weak BSNL connectivity. Zanskar: Has mobile connectivity (BSNL) in some parts. Internet and email services are available in Leh only. Telephone, Fax and post facilities are available in Leh, Padum, Kargil and Nubra valley. The call rate is Rs.2-5/minute at the phone booths. NOT many places have the facility of Credit/Debit cards, so it is advisable to carry cash with you. There are SBI/ J&K/ HDFC/ PNB/ AXIS bank’s ATM available in Leh. However due to huge tourist movements in the season, they are usually jam-packed or out of order. At various places you can/ will have to stay at Campsites, so carrying your own tents, sleeping bags etc. would be a good idea. Packed food and water too would be needed at such places. Inform your family that there will be no network in Ladakh and thus you will be unable to communicate properly for a few days. See your doctor before going to Ladakh – especially if you suffer from any heart related problem or asthma. Carry snacks, biscuits etc. with you. Landslides/road blocks can happen unexpectedly on your way and you would not want to stay hungry at such times. Please avoid wearing shorts and sleeveless shirts, blouses, tops, undershirts etc. in public and especially in Monasteries, Mosques, Temples, Gurudwaras, and Churches. Ladakh is a “no polythene” zone. Kindly respect this and please carry back all the plastic you take with you. DO NOT litter around.